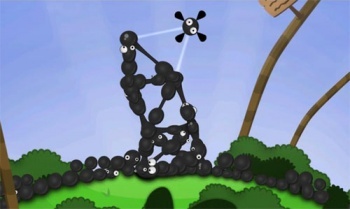 What could possibly make the most innovative, physics-based indie game of 2008 better? How about making it portable? That seems to be the train of thought behind developer 2d Boy's decision to bring World of Goo to the iPhone. Well, that, and the bags of cash potentially available by tapping the huge install base of Apple's cellular. Apparently the iPhone version of World of Goo isn't all that far off either. As IGN reports, the developer already has the game up and running on the platform, with only minor additions left to finalize. Aside from PopCap's addictive puzzlers, I can't think of a better candidate for the transition to a touch-screen based gaming device. Assuming 2d Boy doesn't totally botch the minimalist controls -- or ships a rushed, buggy abortion of a port like the iPhone's iteration of Puzzle Quest -- World of Goo should be a huge hit. Again.